For road cyclists, road rash is unfortunately likely to be something that you encounter at least a few times during your riding career. Icy lanes, drivers, greasy roundabouts and tyre blow-outs; they are just a few of the potential hazards that could leave you with the painful red abrasion to your hips, elbows and knees. I have had my fair share of road rash. The worst was the 2014 season, where I seemed to be plagued by crashes. During that season, I learnt a few tips to help the healing process of tarmac abrasions. 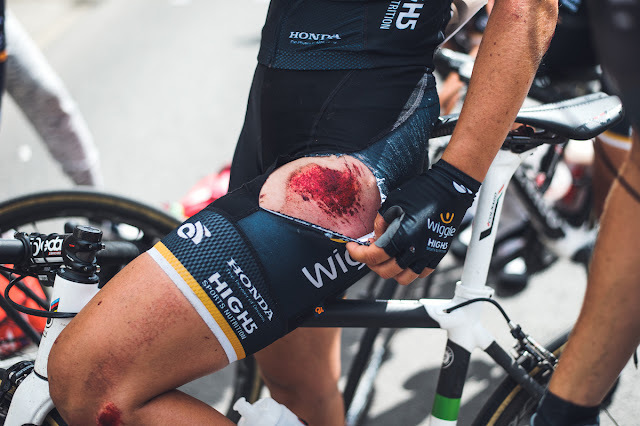 Tarmac is not a hygienic or sterile surface, and getting bits of grit in your road rash and cuts will prolong the healing process, and potentially lead to infection. It hurts like hell, but wash your cut out thoroughly in the shower after the accident, and use antiseptic wipes to really get it clean, before you do anything else. Road rash unfortunately takes a long time to heal, and it can often leave a scar. The best remedy, is to try and keep the area clean and moisturised; promoting new skin growth, and helping to avoid it sticking to clothing and bedding. The best solution that I have found is Sportique's Road Rash Remedy. It is a natural remedy, infused with antimicrobial and antifungal Ozone, which helps to avoid infection. It also has a naturally oily consistency, which tends to stay put and avoid abrasion to the wound; this seems far better than more water-based antiseptic creams, which tend to be absorbed into dressings or clothing. Keep the wound slightly moist, clean and free of abrasion, and it significantly aids skin healing, and reduces scarring. If dressings look like they are getting soiled, either by bodily fluid or from dirt on the outside, then take them off and add a fresh one. Cleaning up the wound, and re-applying the disinfecting balm with a new dressing, will help to refresh and rejuvenate the healing process, as well as helping to ward off infection. Road rash is an unpleasant and painful side-effect of bike riding. With careful treatment though, it need not last as long, or be as painful. I hope these tips help you to heal up quickly.